In his latest book After the Sheihks: The Coming Collapse of the Gulf Monarchies Dr Christopher Davidson, Reader in Government and International Affairs at Durham University, makes the bold prediction that the Arabian Gulf autocracies “at least in their present form – will be gone within the next two to five years”. Ian Sinclair talked to him about these regimes’ continued survival, reasons for democrats to be hopeful and the role played in the region by the West. Ian Sinclair (IS): In the book you note that the obituaries for the Gulf monarchies – Bahrain, Kuwait, Oman, Qatar, Saudi Arabia and the United Arab Emirates – have been frequently written, and yet they continue to exist. What have been the main reasons for their survival to date? Christopher Davidson (CD): Survival has been based on a range of wealth distribution strategies (subsidies, public sector employment, housing, education) afforded by generally resource-rich states. This has been greatly enhanced (with varying degrees of success) by reinvigorating traditional sources of legitimacy, accruing soft power and guaranteeing protection from major military powers. In some cases, very focused repression and censorship has been used to knock out dissidents before their message gains too much traction. On a deeper level, twentieth century-style reform and revolutionary movements never really gained much momentum in the region, due to the absence of either a real proletariat or modernising middle class. IS: You argue that one of the external factors contributing to the continued existence is the large donations made by the Gulf monarchies to UK universities such as Durham, Exeter and the London School of Economics. 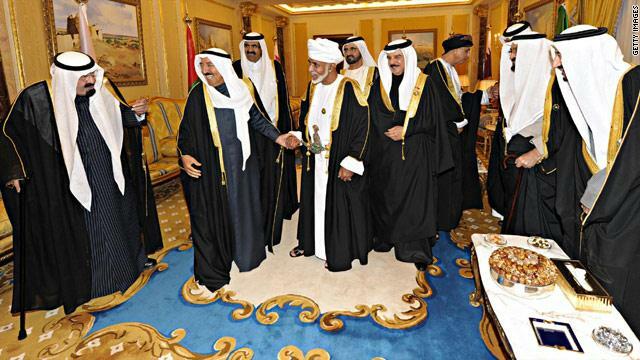 What do the Gulf rulers gain by making these large donations? CD: University donations are part of a much larger strategy of building up influence (or ‘soft power’) in key military powers or opinion-making centres, such as the UK. The rationale is that such countries and their populations may be necessary to have ‘on board’ in the event of a military conflict or a diplomatic crisis. Football clubs, shopping malls, etc., have obvious mass appeal, whereas cultural centres, art galleries, and universities are clearly more focused on shifting debates in favour of Gulf monarchies (or promoting self-censorship and avoidance of certain topics). IS: Your book has gained most attention for your claim the Gulf monarchies “at least in their present form – will be gone within the next two to five years”. What external and internal pressures will turn your prediction into reality? CD: We are witnessing a sort of pincer effect on these states, and one that is rapidly tightening. On the one hand, we very clearly have what we could describe as the political economy concerns, those pressures relating to resources (oil and gas revenues in this case), population size increases, and the declining ability of these states to continue subsidising their citizens in return for political acquiescence. Then, in parallel, we also have what I have tried to describe as the “supermodernising forces” – these are the pressures that are likely to be placed on autocratic regimes by better connected, more modern, more literate, and more urbanised populations. And here we really have the root of the matter in the Gulf states. Of all of the developing world the Gulf has the best infrastructure in place, courtesy of the oil revenues in previous decades, which has created this more modern class in the population. This stands in contrast with many other parts of the developing world, including North Africa and Syria, where we have seen some elements of modern communications, for example, that have clearly played a role in the Arab spring revolution, but it’s still a hazy somewhat unclear role. But now in the Gulf states we’re entering into an era where things like satellite television and social media are accessible by nearly all of the population. So it’s a question of how these new technologies and forces are effectively creating ’new parliaments’ amongst the people. Regarding the rapidity of change, the answer here lies in modernisation theory. We had all these predictions in the past about the inability of traditional monarchies and old political systems that were always likely to face pressure in the face of these new forces of technology. Those predictions were largely wrong due to favourable economic circumstances in the past decades and the sort of fudges that the rulers have been able to come up with whereby they have been able to combine elements of autocratic rule with modern resources, which is one of the things I try to describe in the early chapters of the book. In the later chapters of the book I try to show how those pillars are now being knocked out from underneath the rulers one by one. The most telling sign that we are now entering the final chapter of the traditional monarchies is that they are becoming increasingly willing to use police state strategies, whereas previously repression was never really a primary element of their control and survival. But now we are entering an era where it seems that their other sources of legitimacy are either eroding or even in the process of being destroyed. As a consequence we see increasing numbers of political prisoners, censorship of the media and so on. IS: A common assumption in the Western media is that the US and UK are interested in promoting democracy in the Middle East (e.g. the BBC’s Paul Wood on News at Ten in 2005: British and American forces “came to Iraq in the first place to bring democracy and human rights”). What has been the record of the US and UK in supporting democratic movements in the Gulf since the Arab Uprisings of 2011? CD: As far as I am aware the Western powers have provided almost no support for pro-democracy movements in the Gulf since 2011. The opposite, in fact, has often occurred, where senior Western diplomats have often behaved in a non-neutral manner. This has been noted by the large, youthful populations and anti-Western resentment is understandably growing. There have, however, been some exceptions, especially regarding the US. As a genuine superpower it has been careful, on some occasions, to ‘hedge its bets’ for the long term. The current US ambassador to Bahrain for example has been careful to open and maintain lines of communication with the opposition movements. IS: If democracy is not a key concern for the US and UK in the region, what are the main factors driving Western policy? CD: As mentioned, the US is gradually playing more of a balanced role in the region, seeking long term sustainable alliances (which may well have to switch from the Gulf monarchies to Iran). With regards the other Western powers, notably Britain and France, as non-super powers they are now more or less functioning as trade missions. Undoubtedly drawing on historical links and legacies, their main focus is on trying to secure hydrocarbon interests, trade deals – and unfortunately a substantial part of that trade is still the weapons industry. IS: While countries such as Russia and Uganda have been receiving a lot of flak in the West because of their treatment of gay people, the spotlight is rarely turned on the Gulf on this topic. What is the state of gay rights in the Gulf today? CD: Homosexuality and genuine women’s rights (as opposed to concessions granted by patriarchal institutions) remain stagnant in the region. Although there are some glimmers of hope (such as the women’s ‘right to drive’ campaign in Saudi Arabia) it’s important to note that they are very much ‘bottom-up’ phenomena, as opposed to ‘top-down’ reforms (such as the autocratic appointment of female delegates to Saudi’s consultative council). As for gay men, severe punishments remain in place across the region, with even consensual activity strictly regarded as a criminal offence. IS: Finally, have you had any feedback about how your book has been received in the Gulf itself – by the general population and by the rulers themselves? Are people free to buy the book in the Gulf? CD: The book has been widely read, mostly by people in the Gulf or associated with the Gulf. I believe it’s now in its fifth print run. Most of the sales have of course been made in the West (with books then privately imported into the Gulf) or electronically, as I believe that the book is banned from high street sales in at least four of the six Gulf states. Bans are rarely official, but in Bahrain’s case the explanation has been very specific: the book features a cartoon of the prime minister on the cover – a definite taboo. With regards ruling families, the book has received very mixed reactions. Senior Saudi princes have been in contact, as have senior members of two other Gulf monarchies. Meanwhile, I am aware that senior government members in one particular Gulf monarchy have now begun to make policy changes (both domestic and foreign) based on sections of the book. IS: Thanks for talking to Ceasefire. 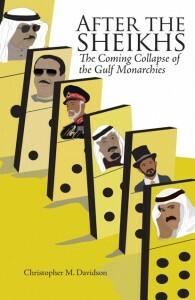 Christopher Davidson’s claim that the Gulf monarchies will collapse in two to five years was made when his book came out in 2012 so by his reckoning we should see them start to fall this year. The reality is that this senior expert on Gulf affairs doesn’t know what he’s talking about. The plaudits his book’s gained are less to do with his foresight as a scholar and more to do with the utter wretched state of discussion on the Middle East. Davidson and the rest of these academics have got the Arab Spring completely wrong predicting that it was about democracy when it fact it’s been far more complicated. But Davidson can rest easy because the good thing for him is that there’s no consequences in academia for being consistently wrong. He can look to the example of the neocons (who with their own enthusiasm for permanent revolution have more in common with him than he might acknowledge) who predicted all sorts of things for a post-invasion Iraq yet have suffered no consequences for getting it wrong – they’re still in their prestigious jobs in academia and think tanks. So Davidson can go talking nonsense about the Gulf and still be an expert on the Gulf.